Welcome to the Ninth Annual Silicon Sasquatch Top 10 Games of the Year list! After months of discussion and yet another marathon five-hour meeting, we've finally narrowed down the 10 games that we feel best represent the best and most important that 2017 had to offer. We'll be counting down through our Top 10 list all week, so stay tuned on Facebook, Twitter, and Instagram to make sure you don't miss a thing! My expectations for Horizon Zero Dawn were low at the start. It was visually stunning, but Guerrilla Games’s previous series, Killzone, had also been technically impressive yet lacking in creativity and storytelling. The tribal motif seemed to borrow too heavily from Native American and First Nations cultures and the featured caucasian leads made that choice a bit collar-tugging. At first glance, the mechanical wildlife looked as though the Earth had been repopulated by the Power Rangers’s Zords. Frankly, I didn’t have much faith Horizon would impress me. But what Guerrilla and Sony demonstrated is that enough faith in an idea, given time to germinate, and room to grow, can become. Horizon manages the impossible feat of making a world of early-civilization-era humans and mechanical dinosaurs seem not only feasible but behave in a plausible way. One of the more fascinating mechanics to watch in any open-world game is how the different AI systems that exist within interact. Each machine and human has its own instincts, allegiances, and responses to the player’s presence. Guerrilla Games takes notes from the popular hunting genre from Japan, made famous by the immensely popular Monster Hunter series. In hunting games, the beasts all have a logic to them. They can be defeated in multiple ways, and any given situation has different circumstances that can be exploited to the player’s advantage. But Guerrilla’s design succeeds by being less obtuse than the typical hunting game. Building a believable world where a robot T. Rex roams the earth and is not ridiculous is impressive, and creating circumstances where it becomes possible for a woman armed with a bow and traps to fell such a thing is riveting. 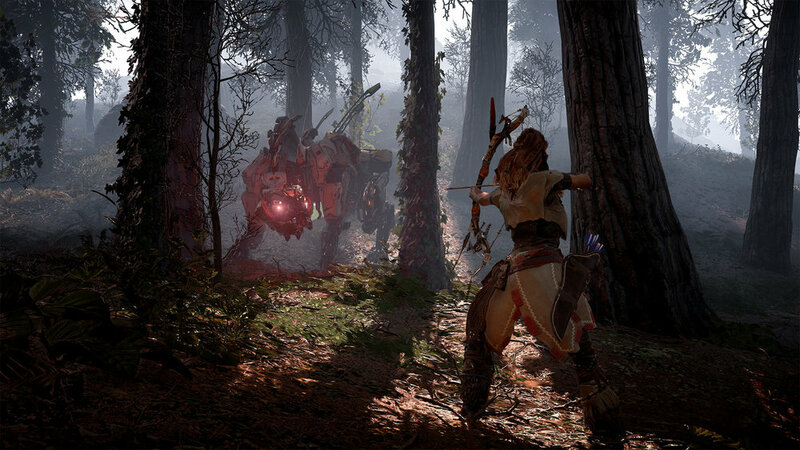 The protagonist, Aloy, had multiple opportunities to fall victim to common sci-fi and video game tropes. She’s competent, people look to her, and they’re attracted to her (both as a leader and a potential paramour). To Guerrilla’s credit, they manage to circumvent clichés and keep Aloy feeling believable. Voice acting in video games, especially for the protagonist of an open-world, requires that a great deal of extraneous and explanatory dialogue be recorded, but hearing Aloy whisper to herself was never annoying or distracting. Instead, it succeeds at reminding the player of how isolated she’s been. Her reactions to her world and the people in it, even when they feel a little silly, doesn’t break immersion, and voice actress Ashly Burch deserves a great deal of credit for breathing life into the character. Horizon’s story begs many questions but at the forefront are two that are intrinsically linked: what are Aloy’s origins, and what happened to the world as we know it. Defying expectations of the current serialized/sequel-driven entertainment culture, both of these are answered over the course of Horizon. Open-world adventures live and die on how successfully they court exploration and pique the interest of those exploring. Peeling back the layers and secrets inside Horizon’s fiction is deeply satisfying and reveals that Guerrilla managed to create one of the more interesting and original science-fiction premises in games. Released back in February, less than a month before The Legend of Zelda: Breath of the Wild, Horizon could have been easily forgotten. It stuck with with me, though, even now 10 months later. It’s one of the most stunning games of this generation of consoles, has one of the best-written and performed lead protagonists in a big-budget story, and taking down a Thunderjaw by shooting off its disc launcher, picking it up, and firing it back at the metal-mouthed monstrosity was one of my favorite airbrushed-van-art moments of the year.